Handmade Ornament - Give the gift that gives twice - support Mayan artisans with your purchase of this stunning, handcrafted ornament. Also can be used to decorate fan or blind pull cords. GIFT IDEA: Place around the neck of your favorite wine bottle and gift to the host of your next holiday party! Made from shiny, high-quality glass beads from the Czech Republic. 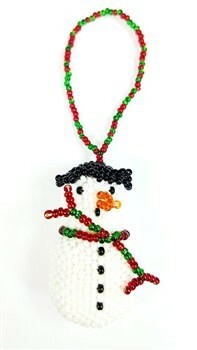 Ornament sizes vary 1-1/2 - 4'' high x 3/4 - 3'' wide.